Gummy, Crunchy, Clumpy, Green Hair? Dive in with Malibu C! What if you could improve the look, feel and condition of your hair every time you dive in? Malibu C Swimmers Conditioner removes elements responsible for swimmers hair, including chlorine, bromine, copper, calcium, lime and salts, which cause hair to feel and look damaged. Draw out buildup caused by exposure to pool, spa and ocean water with this crystallised antioxidant conditioner. Restore sublime shine and colour vibrancy. Remove green discolouration and chlorine odour with ease. Infuse much needed moisture. Nourishing protein blend strengthens hair from within. Dive in! All water is fine for your hair when you have Malibu C.
After shampooing with the Malibu C Swimmers Shampoo, massage throughout hair, then rinse. 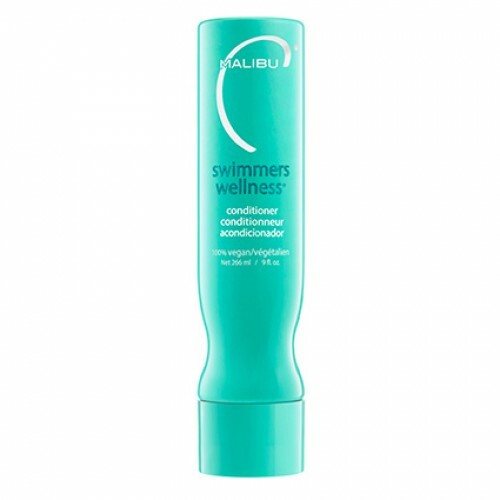 The Malibu C Swimmers Hair Treatment is recommended as a weekly treatment.